I believe most of you Magento enthusiasts out there are using (or at least had at some point used) the official Magento Forum – it’s a great meeting place for a growing community of developers who want to get in touch with experts from all over the world. With 250,000+ total posts to date it’s clearly one of the fastest growing e-commerce communities out there. Of course, for actual collaboration purposes it might be more efficient to create or join an existing Magento Group, but this time I’ll stay with the forums since they are the place most developers would come to initially. As you have probably noticed, in addition to official forums where most of its 149,420 community members (as of November 14) are usually lurking and/or contributing to discussions, there is also a number of international forums available (46 at the moment) because Varien tried to give the opportunity to developers who are less comfortable with English to participate using their language(s) of choice. 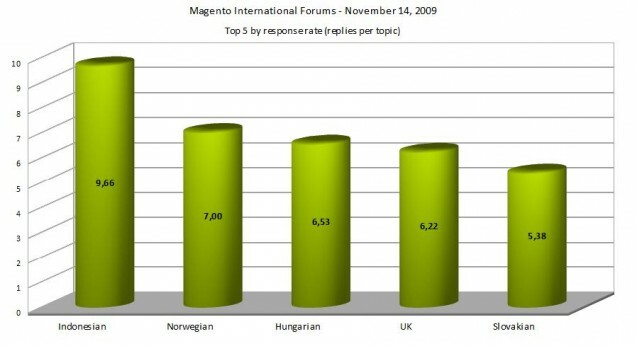 I’ve looked over the Magento international forums stats on Saturday since I was curious to see how well these are used. The international forums make up for only 18% of the total Magento Forum posts, which is understandable since pretty much everyone is using English, especially developers. However, there is considerable activity on these language-specific forums as well. By my own arbitrary decision, after the initial number crunching I’ve decided to leave out of this brief analysis all the international forums that have less than 3 replies per topic or less than 200 posts (topics+replies) in total. I somehow felt that was a minimum for a forum/discussion to even be considered as valid. Otherwise, its “discussion” purpose is simply not achieved (becoming more of a Q&A feature). And guess what? I checked out the stats for the entire Magento forum – the response rate of the Magento community as a whole is currently at 3,08 replies per topic… who’d have known? Unfortunately, that meant I had to exclude the Croatian forum as well but I’ll rationalize that by assuming that this is just the result of Croatian Magento developers being good enough in English to use the official forums without any problems…:-) So, how are these international forums utilized? Unsurprisingly, the German forum is the busiest one with over 20,000 posts (topics+replies) with the French one way behind in 2nd place (some 7,500 posts). Then there are Italian, Brazilian and Russian forums completing the top 5 international forums by sheer volume. This somehow makes sense since most developers from Austria and Switzerland probably also went to German forum with some Swiss developers joining in the French and Italian discussions as well. Of course, these are also the countries with huge population and large numbers of developers so I wanted to come up with a stat that would be somewhat less biased. Let’s see how these forums and their participants rank when it comes to their response rate, i.e. number of replies per topic. And the numbers have turned around completely. Indonesian forum is by far the most responsive one with 9,66 replies per topic. Norwegians run the 2nd most responsive forum, with Hungarian, UK and Slovakian forums also in the top 5. Funnily enough, Germans and French are nowhere to be seen here, both are very near the bottom of the table with slightly over 3 replies per topic. So, how often do you use international forums in your own language? Or are you, like most of us, also focusing your attention only on the official forums in English? I’m from Indonesia myself, the number is surely amazing but in reality it’s not that much. Great idea for a blog post Aron! There are also several unofficial Magento forums in different countries. I saw this one form as a spin-off of UKbusinessForum (not Magento Commerc’s forum) which is interesting as it points out that international community is not centralized around official Magento’s website.